Every five years, each state and metropolitan planning area is federally (23 CFR 450.322)required to update its long-range transportation plans. The MTP represents the transportation goals and objectives of the MS Gulf Coast region. It is a staged improvement program developed in accordance with all applicable federal laws and metropolitan planning regulations. The plan balances and seeks to maximize general welfare and quality of life by promoting a transportation system that is safe, secure, efficient, economically feasible and in harmony with the character of our area. Planning staff work to ensure that no undue burden is experienced by any particular group throughout the planning process and implementation of objectives. Information gathered from a poll in November and December of 2014 is similar to the feedback received online and during meetings. The polling method allowed us to hear from a representative sample of Mississippi’s general population and to identify and reach under-represented and hard-to-reach populations. The survey was fielded in both English and Spanish for those 18 and up. Both urban and rural residents were surveyed. Data gathered was weighted based on a census representaton of the entire state. 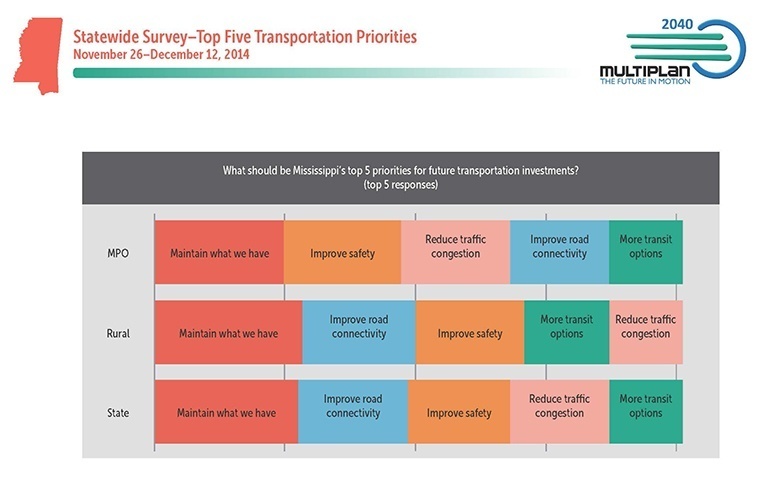 As we heard during the meeting and online., those surveyed in the statewide poll also feel that maintaining our transportation system should be our top priority. Improving safety and road connectivity, reducing congestion, and providing more public transit options all ranked near the top.